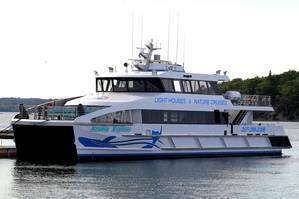 A pair of multifunctional 29-meter catamaran passenger vessels, Acadia Explorer and Schoodic Explorer, have been delivered on the U.S. East Coast. Designed by Incat Crowther and built by Gulf Craft in Franklin, La. for Bar Harbor Whale Watch Co, the USCG Subchapter T certified vessels will be used for whale watching excursions, nature cruises and light house tours in the Acadia National Park and surrounding areas as well for providing tender services to cruise ships which frequent picturesque Bar Harbor, Maine during the spring and summer months. Propulsion is provided by two Caterpillar C32 ACERT rated at 970 kW at 2,100 rpm driving two Hamilton HM571 waterjets with a service speed of 25 knots. Ride control for passenger ride comfort is provided by a complement of Humphee interceptors. Electrical power is provided by a pair of Caterpillar C4.4 generating sets. The large pilot house is equipped with wing stations and the latest electronics for safe navigation, while the roof above the pilot house is fitted with a station for a naturalist who is tasked with disseminating information to passengers about landmarks and wildlife which are within viewing distance. The vessels feature three boarding areas on each side of the vessel to facilitate efficient loading and unloading and a pair of stairs leading to the upper deck enhances passenger flow. The ADA-compliant main deck cabin has seating for 114 passengers in a climate-controlled interior. In addition the forward doors provide access to the exterior foredeck seating for 16 passengers. The vessels feature ergonomic seating fitted with tables, a large kiosk serving various snacks and refreshments and five televisions for entertainment. The aft end of the accommodations includes two heads, one of which is ADA compliant. The upper deck provides a spacious and open view of the environment with seating for 65 total passengers, with 36 under cover. Entertainment is provided by a large screen centerline television.